15th IEEE International Workshops on Enabling Technologies: Infrastructures for Collaborative Enterprises (WETICE-2006) The University of Manchester, Manchester, U.K.
Each presentation is 30 mins (25 mins presentation plus 5 min discussion). With distributed information systems and the Internet continually increasing in significance, collaboratively creating and managing information has become an essential requirement for the success of (virtual) organizations. This situation has led to a plethora of platforms supporting cooperation as well as joint information access among geographically dispersed user communities that have emerged in the last decades: collaborative information spaces, telecooperation, autonomous agents or, more recently, various Web-related forms of communication and cooperation such as discussion forums, community portals, Wikis and blogs. A fundamental requirement for an effective collaboration is the availability of technologies and tools which provide an explicit and unambiguous representation of the shared information and a feasible management of such semantics-enhanced information repositories. 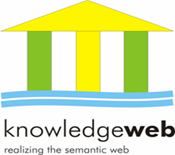 The emergence of the Semantic Web has marked an important stage in the evolution of semantic technologies. In this context the knowledge components i.e. ontologies are formalized using Web-suitable, but in the same time semantically unambiguous representation languages, are accessible and can be shared and reused across the World Wide Web. The Semantic Web offers new opportunities for the next generation of collaborative applications: it provides us with novel means to classify information items i.e. by means of ontologies which formally represent the consensual understanding of the application users w.r.t. a particular domain of interest. Taking advantage of this technology, the first promising implementations of Semantic Web-based collaboration platforms such as Semantic Web portals, semantic Wikis and blogs, to name only a few, have been proposed. This workshop aims at contributing to this young application field by providing a forum for practitioners and researchers to present innovative approaches to applying Semantic Web technologies in collaborative environments and to discuss the opportunities and challenges related to this topic. The primary objective of this workshop is to gather researchers and practitioners working in different emerging aspects of semantics-enabled collaboration, ranging from discovering new application scenarios, proposing new methods to apply Semantic Web and related emerging technologies to current environments, pointing out issues that still need to be solved, and reporting results and experiences gained during the deployment of collaborative methods and the realization of support systems. Submission of papers will take place electronically at http://conference.ag-nbi.de/stica06. The papers should be submitted in PDF format and should not exceed 6 pages in IEEE Proceedings Format (LaTeX formatting macros, Word format). This will also be the page limit for the proceedings. All submitted papers will be peer-reviewed by a minimum of three people. The accepted papers and the summary report on the workshop will be published in the post-conference proceedings and directly mailed to the registered authors by the IEEE Computer Press after the conference. Please note that in order for an accepted paper to be published in the conference proceedings at least one of its authors is required to register and present the paper at WETICE-2006. This workshop is sponsored by the EU Network of Excellence KnowledgeWeb and the BMBF funded project Wissensnetze.